I have been in love with Cheesy Broccoli Rice since the first time I had it. 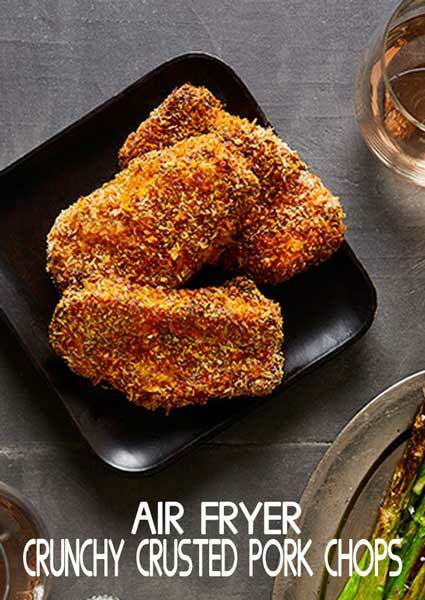 I love all the great flavors mixed together in soothing comfort food like this one. You won’t believe how easy it is to make this awesome side dish. 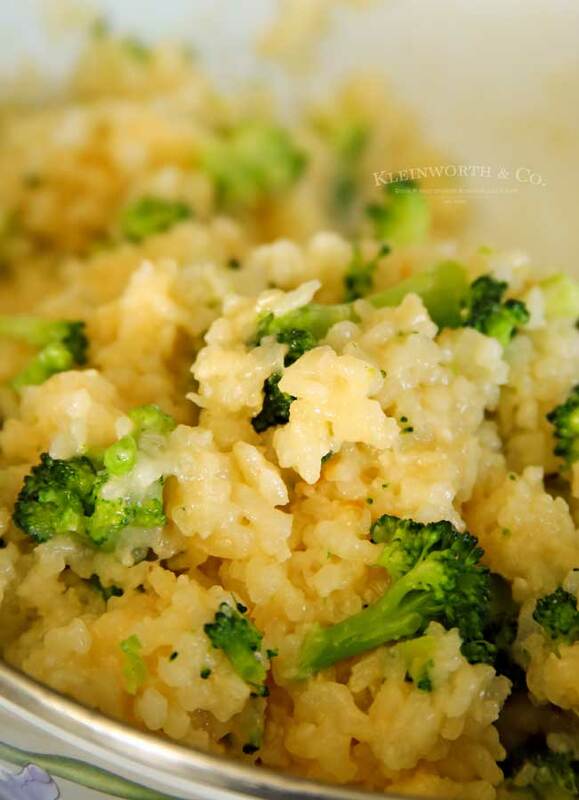 Cheesy Broccoli Rice is a favorite side dish recipe paired with almost any meal. Make this recipe in a rice cooker, slow cooker or pressure cooker. 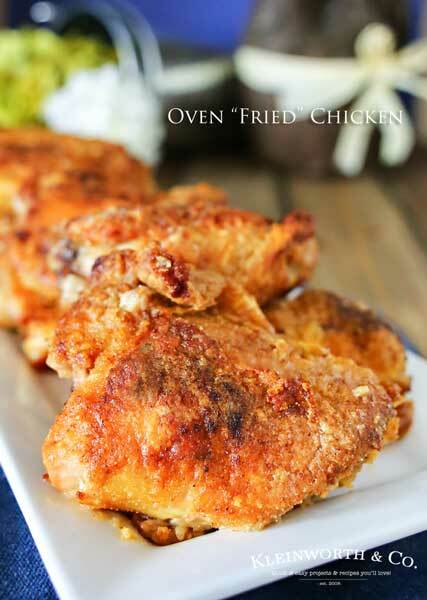 Now, we have been making this recipe for years using our rice cooker. But a couple of years ago I figured out how to make risotto in the slow cooker & decided to adapt this recipe to be made in the same way. Then when the pressure cooker craze came about, I knew it would be great to give it a try in there too. **I’m including all methods in the recipe below. This post is sponsored by RiceSelect. All comments and opinions are my own. This rice recipe is not only great for weekday meals with the whole family, but also fantastic for entertaining. This is always a hit no matter the occasion. What I feed my family is really important to me. I particularly love that RiceSelect products are natural and clean of preservatives, chemicals, and added substances. They are also Non GMO verified. Did you know that they believe that transparency and quality are core to who they are and what they make. That’s why they package all of their products in clear, re-sealable, reusable, 100% recyclable BPA-free jars. I can get behind that. Please, please, this is so important to making this recipe. 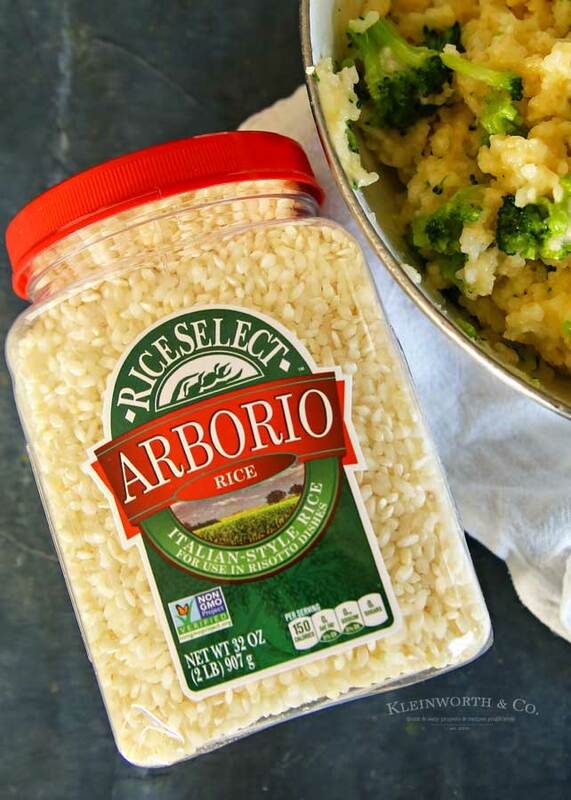 By using Arborio Rice we are able to omit things like cream soups or heavy cream. This rice makes it easy to make this recipe creamy. What can I pair this rice with? 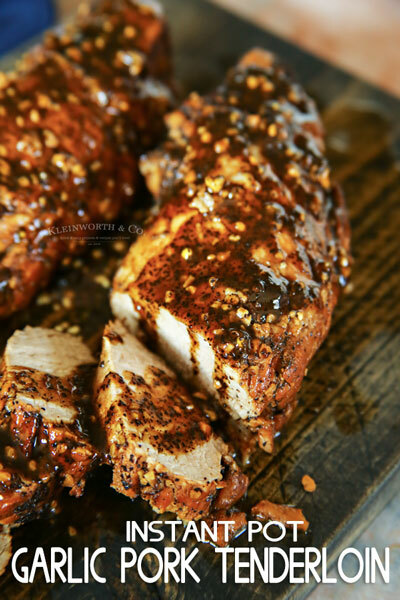 We love to pair it with smoked sausage, grilled chicken breast or pork chops. Sometimes we have it alongside burgers or hot dogs when we are having an easy weekend out in the yard. 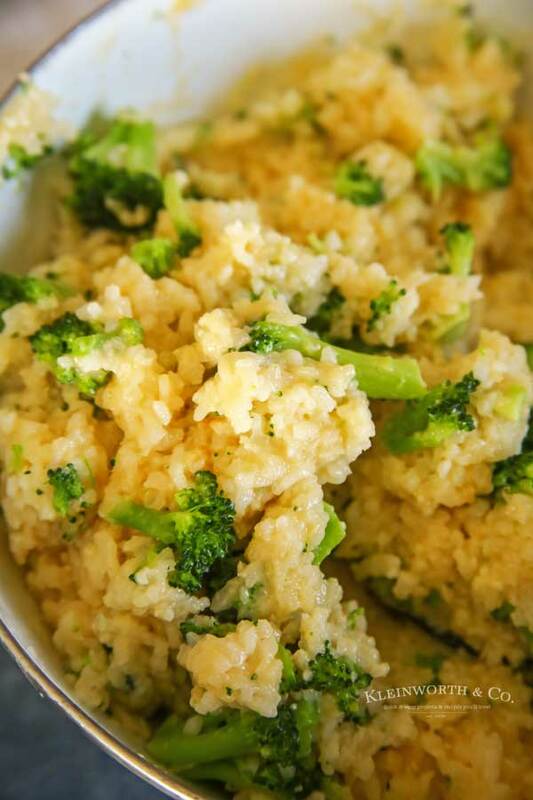 HOW DO YOU MAKE Cheesy Broccoli Rice? Combine rice, butter, minced onions, minced garlic, broth, salt, black pepper in the rice cooker. Stir until blended. Cover rice cooker and press cook switch down. The rice will cook for about 25 minutes. 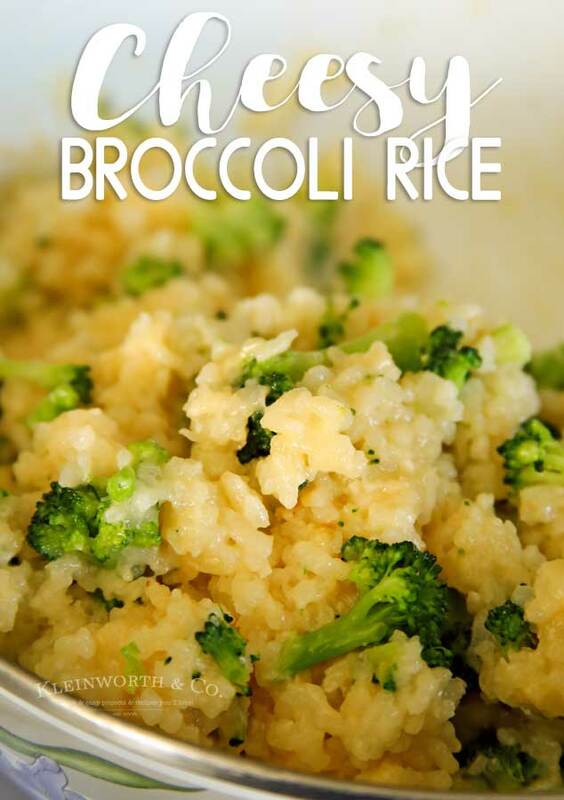 While the rice is cooking, place broccoli in a small saucepan & fill half full with water. Bring to a simmer over med-low heat. Strain & set aside. When rice cooker switches to WARM, stir in broccoli & cheese. 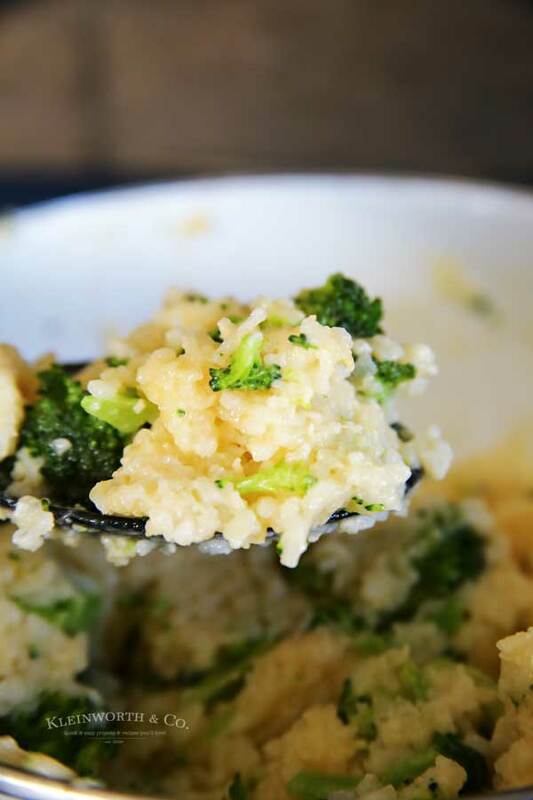 HOW DO YOU MAKE Pressure Cooker Cheesy Broccoli Rice? Turn on your Instant Pot to the saute setting. When the display says HOT, add in the butter, minced onions, salt & garlic & rice. Saute and stir for about 1 minute. Add the broth and stir for 2 minutes. Cover the pot and secure the lid. Make sure the valve is set to sealing. Set the manual/pressure cook button to 10 minutes (high pressure). Once the rice is done cooking, natural release for 10 minutes and then quick release. Remove the lid. Stir in the cooked broccoli & the cheese. 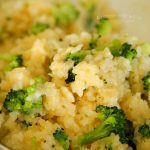 HOW DO YOU MAKE Slow Cooker Cheesy Broccoli Rice? Pour the rice in the bottom of your slow cooker. Pour broth on top of the rice. Sprinkle in the minced onions, minced garlic, salt, and pepper. Cover and cook on LOW for about 2-4 hours, until rice is cooked. Stir in ½ the cheese. Then sprinkle the remaining cheese on top. 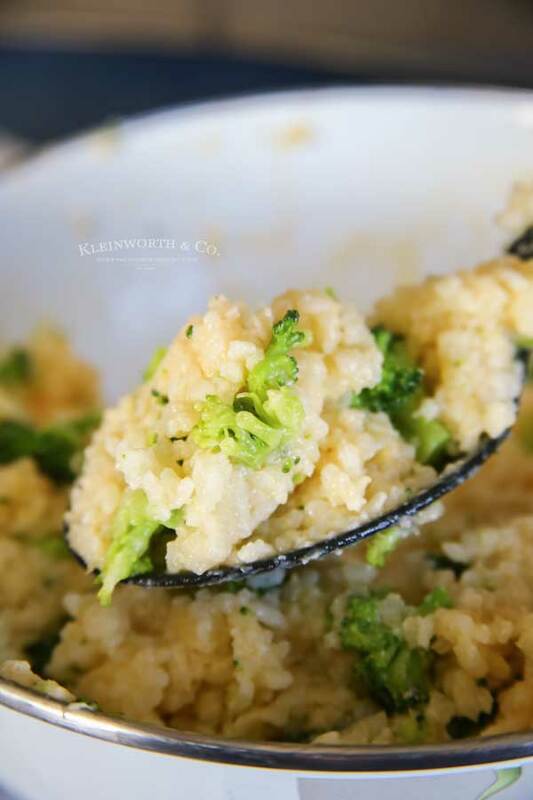 This really is our all-time favorite side dish & I know it will be yours’ too. Looking for dinner recipes to pair with this rice?